After a chilly spring it seems summer finally made its presence known through the end of June with high temperatures, humidity and heat warnings. While we’re thrilled to welcome summertime, we’ve been reminding our followers of the importance of playing smart in the sun this season. As adults, we know to apply sunscreen with a high SPF, limit direct sun exposure, and be vigilant about signs of heat exhaustion. But it can be more difficult knowing how to protect an infant in the heat. Since babies are so temperature sensitive, some new parents are unsure about how to keep their infant at a comfortable, safe temperature. Babies have thin, sensitive skin, so sun exposure should be limited. Cover your baby’s arms and legs in light, cool clothing, and if necessary, use a natural sunscreen that’s formulated for infants and toddlers. 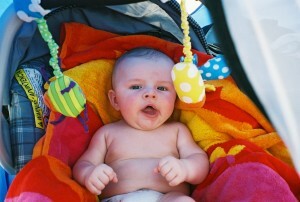 Shade your baby with a hat and by draping a light sheet over your stroller if the sun is strong in a clear sky. Watch for clues that your baby is overheating or dehydrated. A red face and hot skin are the first signs that your infant is too warm. Symptoms and markers of dehydration include a sunken “soft spot” on your baby’s head, sleepiness, irritability, and a decrease in wet diapers. Babies don’t have a large fluid reserve and if they have diarrhea it’s easy for them to become dehydrated. Be extra careful in the hot weather! Remember that AC will affect your baby to a more extreme degree–just like the heat. It’s easy to overlook how chilly air conditioning can be on muggy hot days. While it’s often essential for comfort, air quality and sleep, just be mindful of how cold your home is when dressing your baby. Consider where the AC vent is in your nursery in relation to your crib, and cover babies in light layers for sleep. 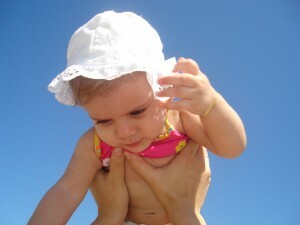 Some breastfed infants may need to nurse more frequently in hot weather, but you may notice no change with your baby. Babies don’t have many adjusted dietary needs in the heat, and they get enough water in your milk supply. Make sure your toddler is replenishing fluids by keeping a sippy cup on hand at all times. At intervals in play, make sure to encourage a few sips of water. If your toddler doesn’t like to drink water, try adding frozen fruit in place of ice cubes to add some natural flavour. Infants release sweat to cool their bodies down, but because their pores are so tiny, they’re susceptible to getting clogged. The result is heat rash, which appears as prickly little red dots, bumps or blisters on the skin. 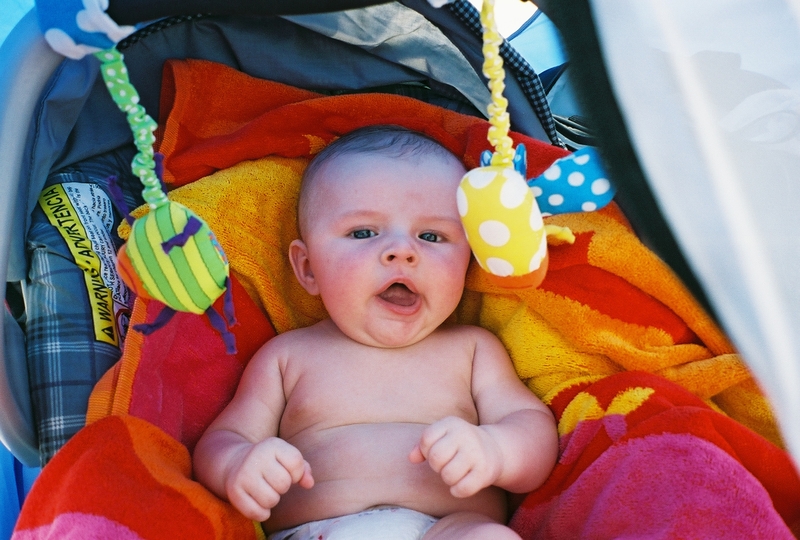 While heat rash is common and not serious, it’s a sure indicator that your baby is overheating. Heat rash isn’t typically painful but your baby may feel uncomfortable, tender or itchy. Try removing clothing in the house and letting your baby play in a diaper. A tepid bath can help to cool your baby’s skin. At bedtime a light fan is an easy way to provide a soothing breeze- just avoid aiming it directly at an infant. Heat rash should clear up fairly quickly. Babies react to temperature changes differently, but it’s always important to remember that a small infant is much more sensitive to the heat (and cold) than an older child or toddler. Protect your baby and watch for signs that he or she is uncomfortable. Let’s make sure it’s a cool and healthy summer!